Features an innovative heat-bonded outer shell membrane construction OUTDRY®, which provides an impenetrable layer with no seams, preventing water collecting between layers for lighter, improved fit and greater dexterity and comfort. Primaloft 100g and 80gr insulation for excellent warmth-to-weight ratio. The material’s advanced ultra-light fibers trap heat while insulating from cold and are water-resistant for improved thermal performance. THE EQUINOX OUTDRY® GLOVE is CE certified level 1. 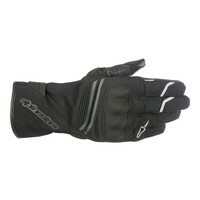 Alpinestars Equinox Outdry gloves are the first I’ve seen with Outdry technology for the glove’s waterproof capabilities. Over the years, we’ve offered hundreds of waterproof gloves, and they fall into one of two camps…. the Gore-Tex liner and the “generic” waterproof liner. Products using Gore-Tex usually command a premium of about $50 as compared to a similar glove with generic waterproofing. The Gore-Tex brand is widely regarded as the best waterproof technology around because of its ability to keep water out but also to allow moisture to escape. Now comes the OutDry technology. OutDry is the brand of waterproofing and it is a subsidiary of Columbia Sportswear. When I search on the web for OutDry, I see LOTS of products available in all sorts of sporting goods categories, so obviously the product has some chops. What’s different here is that the OutDry liner is bonded directly to the boot’s upper material rather than being installed as a “bootie” between the boot’s exterior shell and the interior lining. By bonding it,water does not pass through the outer shell and lessens the chances of leaks and waterlogging of the boot assembly. Here’s a detailed explanation. The Outdry alternative is priced comparatively to GoreTex, which also offers the “bonded” construction.